Gene transfer into the amniotic fluid using recombinant adenovirus vectors was shown previously to result in high efficiency transfer of transgenes into the lungs and intestines. Adenovirus mediated in utero gene therapy, however, resulted in expression of the transgene for less than 30 days. Recombinant adenovirus associated viruses (rAAV) have the advantage of maintaining the viral genome in daughter cells thus providing for long-term expression of transgenes. Recombinant AAV2 carrying green fluorescent protein (GFP) was introduced into the amniotic sac of fetal rodents and nonhuman primates. Transgene maintenance and expression was monitor. Gene transfer resulted in rapid uptake and long-term gene expression in mice, rats, and non-human primates. Expression and secretion of the reporter gene, GFP, was readily demonstrated within 72 hours post-therapy. In long-term studies in rats and nonhuman primates, maintenance of GFP DNA, protein expression, and reporter gene secretion was documented for over one year. Because only multipotential stem cells are present at the time of therapy, these data demonstrated that in utero gene transfer with AAV2 into stem cells resulted in long-term systemic expression of active transgene roducts. Thus, in utero gene transfer via the amniotic fluid may be useful in treatment of gene disorders. In utero gene transfer is a successful method for transferring genes to the developing fetus. Providing a therapeutic gene to the developing fetus allows for the treatment of a genetic defect before the comorbidities of the disease occur. Many genetic diseases can be detected in utero, and the prenatal treatment of these diseases could prove beneficial. The fetus provides a unique environment for gene transfer because one can influence differentiation and proliferation of target cells. In addition, the fetal environment provides the additional benefit of an immature immune system where vectors are not seen as foreign [1, 2]. This laboratory has shown that in utero gene transfer via amniotic fluid is an effective method for introducing genes into epithelial multipotential stem cells of the lung and intestines [3–8]. Gene transfer is performed at a gestational age comparable to a 5–15 week human (15–16 days in mice; 16–17 days gestation in rats; 90–110 days in rhesus). During this critical time of development, undifferentiated epithelial cells, the targets for the vectors, line the lung and intestine. These cells are the targets for our vectors. Organ development and growth continues after the infection and the differentiated daughters of the targeted cells continue to express the transgene. Short-term adenovirus-mediated in utero gene transfer has now been successfully demonstrated in three species: the mouse, the rat, and the rhesus primate. The use of recombinant adenovirus is limited to studies examining the role of a specific gene during a very limited time period. The non-integrating properties of the vector limit expression to the lifespan of the cell-approximately 10 to 30 days in the intestine and lung, respectively. Recombinant adeno-associated viruses have the advantage of being maintained for longer periods of time, and the infection of a multipotential stem cell with this vector would have a significant advantage over adenoviral-mediated gene transfer for many disease models. Experiments were performed to determine if rAAV2 would infect the fetal lung and intestines efficiently. Mouse fetuses (20 in two liters) at 15–16 day gestation were infected with rAAV2CMVgfp via intra-amniotic injection of 108 pfu/ml of amniotic fluid. Whole embryos at 72 hours post-therapy were fixed, and frozen sections were prepared for viewing with the deconvoluting microscope. As shown in Fig. 1, the rAAV2 transgene is rapidly transferred and expressed in both the lungs (panel A) and intestines (panel B). 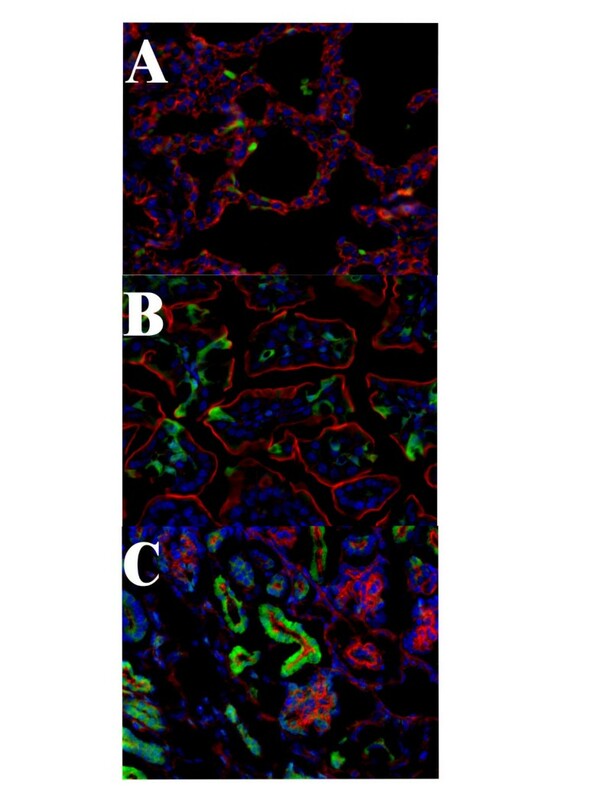 All other organs, except for the kidney (see below), were negative for gfp-specific staining. This laboratory has previously demonstrated that transgenes delivered by in utero gene transfer expressed proteins that were secreted regardless of the presence or absence of a secretory signal . In addition, it was further demonstrated that the kidney, which cannot be infected via intra-amniotic in utero gene transfer, filters virus-delivered transgene products from the circulation. Based on molecular weight, the gap junction in the glomeruli differentially partitions proteins into either the efferent tubules or glomeruli. Proteins greater than 80,000 molecular weight collect in the glomeruli while those less than 80,000 pass through the glomeruli and collect in the efferent tubules. The protein in the efferent tubules appears as an intracellular signal, while in the glomeruli large aggregates of protein were found . By 72 hours post gene transfer, transgene expression was sufficiently high for systemic circulation of protein (Fig. 1, Panel C). Because GFP has a molecular weight below 80,000, it was filtered by the kidneys and collected in the efferent tubules. Although the efferent tubules are positive, there is no evidence of GFP protein in the glomeruli (round clusters of blue-stained nuclei with red-stained membranes. Thus, both adenovirus and rAAV2 vector-delivered transgenes produce high levels of proteins that are released into the systemic circulation and subsequently filtered by the kidney. To evaluate the expression and long-term persistence of rAAV2 genes and extend the efficacy of in utero rAAV2 to another species, Sprague-Dawley, the rats were treated in utero at 16 days' gestation with the rAAV2CMVgfp virus. Tissues were examined for the presence of gfp-specific protein by immunohistochemistry and DNA by Southern blot analysis. At nine months of age, rat lungs were harvested and fixed for paraffin sections for immunohistochemistry. As shown in Fig. 2, GFP was readily detected at 9 months of age in the airways of all animals tested. Thus, rAAV2 vectors readily infected the lungs of rats, and transgene expression occurs long-term. Rats were followed up to one year of age, and DNA was extracted from both the lungs and intestines. 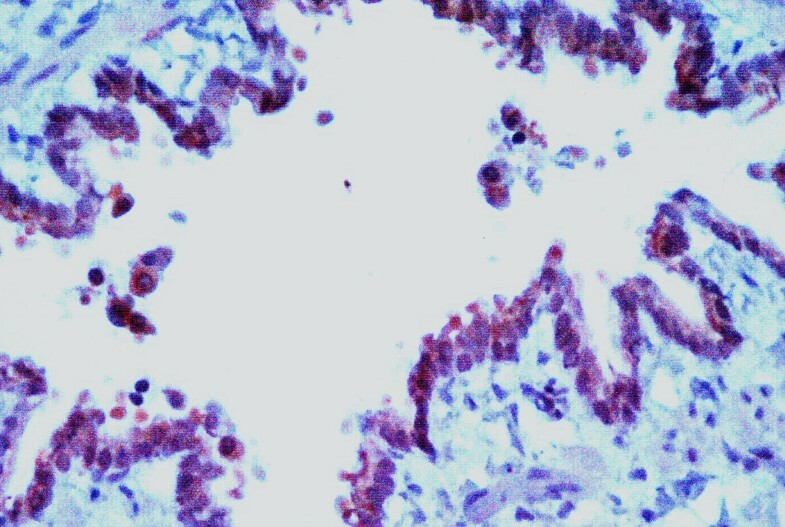 Although the intestines are a primary target of in utero gene transfer from the amniotic fluid, no GFP DNA was detected by Southern blot in these tissues. This indicated that the dilution of transgene had decreased to levels below detection and /or that the original transfer efficiency of the intestine multipotential stem cells was poor. In contrast, GFP DNA was found in all the rats' lungs at 12 months of age as demonstrated in Fig. 3. GFP-specific sequences in rat lung at 12 months of age. DNA was extracted from rat lungs. Undigested DNA (10 μg) was electrophoresed on agarose gel for Southern blot analysis. DNA from rAAV2gfp infected 293 cells was used as a positive control. 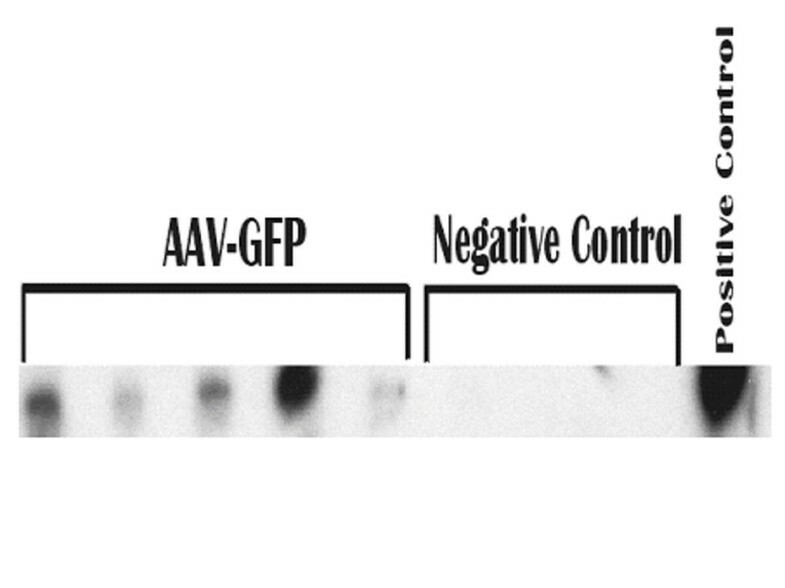 Lanes labeled AAV-GFP represents DNA from separate animals infected at 16 days gestation with rAAV2gfp. Negative Control labeled lanes are from age-matched animals not infected with an rAAV2. The in utero uptake of the rAAV2 in the mouse suggests that this vector could be effective, for the reversal of metabolic defects. For this gene therapy to be effective it must translate well from rodents to humans and it must persist over extended periods of time. To test both these parameters a Rhesus macaque was infected with rAAV2-GFP at 100 days' gestation, allowed to deliver, and then tissues examined for GFP expression at 15 months of age (16 months post-infection). This gestation time is comparable to that used for both mice and rats (Figs. 1,2,3; ). 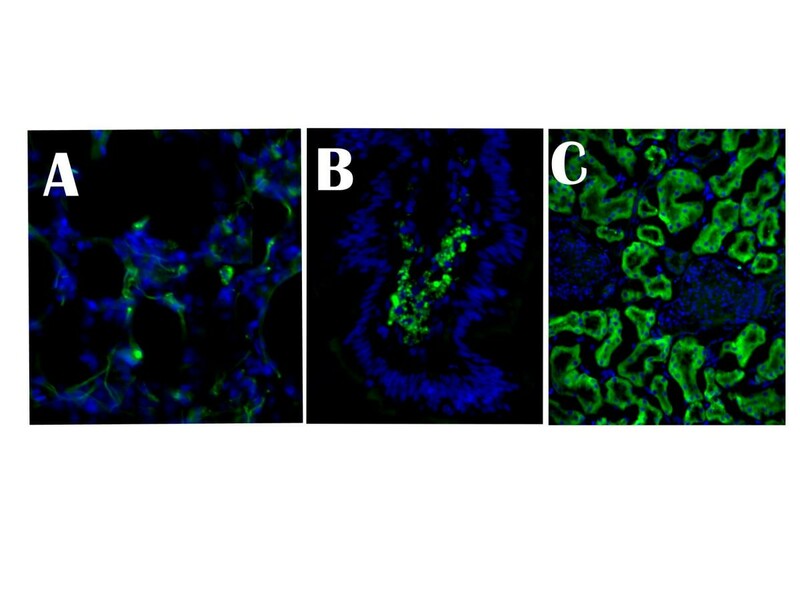 The lungs from the NHP showed both type I and type II cells positive for GFP expression (Fig. 4, Panel A). These cells were scattered throughout the lung parenchyma and were readily apparent in all sections of the lung. Thus, rAAV2 DNA and gene expression are maintained in lungs of the NHP. 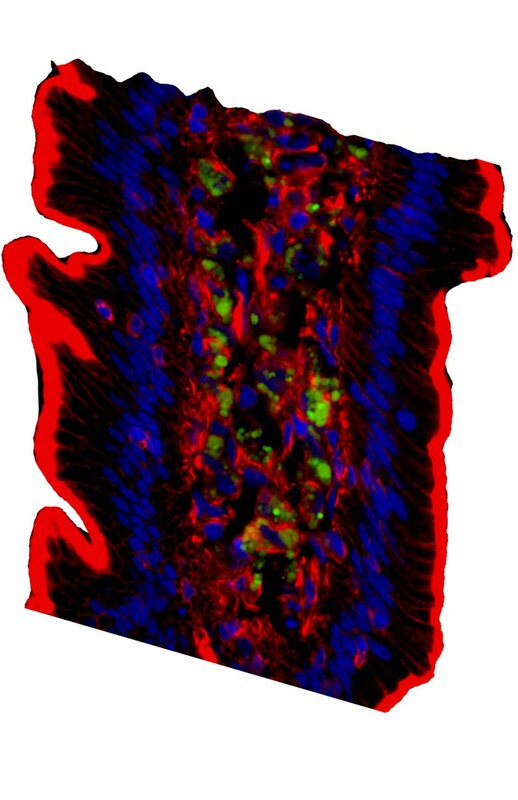 Like the lungs, the rhesus' intestines showed random (<5%) villi positive for GFP (Fig. 4, Panel B). Because cells in a villi turn over every 72 hours and differentiation occurs outwardly from stem cells located in the crypt, this distribution was consistent with the maintenance of individual clones of stem cells transfected by the rAAV2. In addition, the finding that only random villi were positive for transgene expression was consistent with the rat studies where long-term gfp-specific DNA sequences could not be detected. This suggests that only a small proportion of stem cells in the intestine become infected with the transgene and that maintenance of transgene expression over a long period of time is reduced. In addition, the protein appears to collect in the lacteal, which includes the lymphatics of the intestines. The finding that transgene protein was present primarily in the lacteal of the intestines suggests that either epithelial cells were secreting the protein into the lymphatic fluid or that phagocytic cells of the lymphatics were scavenging this protein. To determine if the transgene protein was in phagocytic cells or free in the lymphatics, the sections were stained with both fluorescently labeled phalloidin toxins to stain membranes and DAPI for nuclei; and they were then analyzed by high-resolution, deconvoluting microscopy. As shown in Fig. 5, GFP is not associated with specific cells but rather was present in the lymphatic fluid of the intestines. Thus, the secretion of transgene proteins from intestinal epithelial cells results in release into the lymphatics. This finding would account for the protein seen in the kidneys because the lymphatics drain into the general circulation from which proteins would be filtered by the kidneys. There are several features that make AAV2 an attractive vector for gene therapy protocols. First, AAV2 has the ability to remain expressed throughout the full life cycle of a cell by integrating into host cell DNA or remaining episomal inside the cell. Wild-type adeno-associated virus has been shown to integrate into chromosome 19 in the host cell by non-homologous recombination mediated by the rep gene products [9, 10]. Recombinant AAV2 lacks the rep gene has been shown to integrate nonspecifically into host cell DNA or remain episomal. In either case, the AAV2 genome is persistently expressed using the host cell's machinery . This feature is important in gene therapy because it could allow for a single injection of a therapeutic gene without the need for re-administrations. It is well known that repeat administrations of a vector can lead to antibodies against the transgene, rendering it ineffective. Secondly, rAAV2 has broad transduction capabilities because it is able to transduce many cell types including the lungs, neurons, muscle, intestine and hematopoietic cells . In addition, rAAV2 can transduce mitotic and post-mitotic cells . At the time of injection, stem cells in the lungs and intestines are undergoing rapid differentiation and proliferation and therefore are easily able to be transduced by rAAV2. Third, rAAV2 is an attractive vector because it is safe as compared to other viral vectors. Ninety-six percent of the genome is removed when preparing rAAV2 vectors because only the inverted terminal repeats are needed for viral replication, packaging and integration. In addition, for AAV2 to enter the lytic phase of its life cycle it requires infection with a helper virus such as adenovirus or herpes simplex virus. Otherwise, it remains latent inside the host cell. This paper demonstrates long-term transgene expression following in utero transfer of rAAV2 into three species by direct fluorescent visualization (Figs 1, 4, and 5), immunohistochemistry (Fig. 2), and Southern blot analysis (Fig. 3). There are several important considerations when performing these in utero gene transfers. First, developmental timing of therapy is perhaps the most significant factor in successful gene transfer to the fetus. In all species the cannalicular stage of lung development was targeted in both rodents and non-human primates. This period corresponds to 10–15 weeks' gestation in humans. The dose of the virus is also a significant component of successful intra-amniotic gene therapy. Excessive virus leads to an immune response and loss of cells producing the transgene. Finally, the anesthetic used can affect therapy. Anesthesia is concentrated in the fetus and inhibits fetal breathing and swallowing. Long-acting anesthetics such as Ketamine interfere with transgene delivery. All animals in this study, including NHPs, were anesthetized using isoflurane only. Recently, Boyle et al. demonstrated gene transfer into rabbit pulmonary epithelium using AAV2 with transgene expression for only 24 days. This can be attributed to their injection of the fetuses during the late saccular phase of lung development. Recently, others have reported the use of AAV2 for in utero gene therapy experiments and have shown long-term expression of the transgene product in target tissues for 3 months  to 18 months when given intra-peritoneal . Perhaps one of the more remarkable and important features of in utero gene therapy presented in this paper is the finding that with both adenoviruses  and rAAV2 (Figs. 1, 4, 5) the transgene product is continuously secreted into the general circulation. The protein secretion is not dependent upon the presence of a secretory signal as demonstrated by both luciferase and beta-galactosidase (this paper and ). As shown in the embryonic mouse, transgene protein is secreted within 72 hours, and highly significant quantities of the protein are readily apparent in the kidney. The high resolution, 3-dimensional, deconvoluting microscopy analysis of NHP intestines at 15 months of age (16 months post-therapy) demonstrated that epithelial cells of the intestines are secreting the transgene protein into the lacteal for lymphatic drainage into the general circulation via the thoracic duct. At the time of in utero gene therapy, both the gut and lung are lined with multipotential stem cells. Infection of these cells with rAAV2 leads to a permanent population of cells producing and secreting the transgene protein. Given this data, in utero gene transfer with rAAV2 can be useful in treating metabolic diseases by providing long-term gene expression and significant circulating levels of the transgene protein. Insertion of metabolic enzymes active in plasma could alleviate certain genetic disorders. Time-pregnant C57Bl/6 mice and Sprague-Dawley rats (Harlan-Sprague-Dawley, Indianapolis, IN) were anesthetized with isoflurane and the fetuses surgically exposed for injection via amniotic fluid with replication defective rAAV2 (rAAV2CMVgfp; generously provided by Dr. James Wilson). The control fetuses were not injected. Time-pregnant Rhesus macaque was anesthetized only with isoflurane; the fetus visualized by ultrasound; and the recombinant virus delivered by trans-abdominal infection into the amniotic fluid. All fetuses were treated with 108 pfu/ml of amniotic fluid. EGFP-plasmid DNA was subjected to PCR for amplifying GFP to use as a probe in our Southern blot analysis. Using the Qiagen Gel Extraction Kit Protocol, the GFP PCR fragment was extracted and purified from the agarose gel. Then using the Amersham Redi prime II system, the probe was prepared by adding radiolabelled 32P-CTP to the purified GFP fragment. The agarose gel with uncut DNA from each sample followed by transfer to nitrocellulose membrane overnight using 2X SSC. Membranes were placed in a hybridization tube with 15 mls of hybridization buffer (Quik Hyb-Stratagene). The GFP probe was then added and allowed to hybridize overnight. Finally the membrane was exposed to film. Aliquots of tissue were fixed in 4% paraformaldehyde overnight for paraffin embedding. Tissues were parallel processed with non-infected tissues. GFP expression was confirmed by immunohistochemistry using a polyclonal GFP antibody at a 1:1000 dilution. Control tissues included uninfected tissues as well as tissues parallel processed without primary antibody. After antigen capture (Vector Antigen Unmasking Solution), the tissue was incubated at 4 degrees Celsius for 12 hours with primary antibody and amplified with an avidin/biotin system (Vectastain ABC Kit; Vector Laboratories, Inc., Burlingame, CA) and developed with 3-amino-9ethyl-carbazole (Vector AEC Kit) and counterstained with hematoxylin. Fluorescent imaging was performed on a deconvoluting microscope. Nuclei were visualized by DAPI staining and membranes by fluorescently labeled phalloidin. Fluorescent analyses of samples were performed in a Leitz deconvoluting microscope. Untreated control and experimental samples were digitally deconvolved (nearest neighbor analysis) and color processed in parallel. Only when all fluorescence in the wavelength with GFP was completely eliminated from the control samples was documentation of experimental samples performed. This project was funded by the Ochsner Clinic Foundation and the Core Grant of the Tulane University Primate Center. D.J. Garrett performed the molecular studies. Daisy Dunne assisted with mouse work. Luis Marrero performed the deconvoluting microscopy. Janet E. Larson and J. Craig Cohen conceived the projects and supervised all personnel.